Posted on June 16, 2018 Posted in France	. This recipe came to me when I was looking at pairing two strong, similar and complimentary flavours together, these being Green Tea (a core Asian slightly bitter tea) with pistachios (core Middle East staple nut). To balance out the savouriness on the palette I then introduced the integration of white chocolate. Though the mix of Asian, Middle Eastern and French (the origin of Eclairs ) palettes sounds bazaar and all over the shop this little treat is super tasty, delighting all that experience its uniqueness. Pre-heat the oven to 200c degrees and place baking paper on 2 large baking trays. 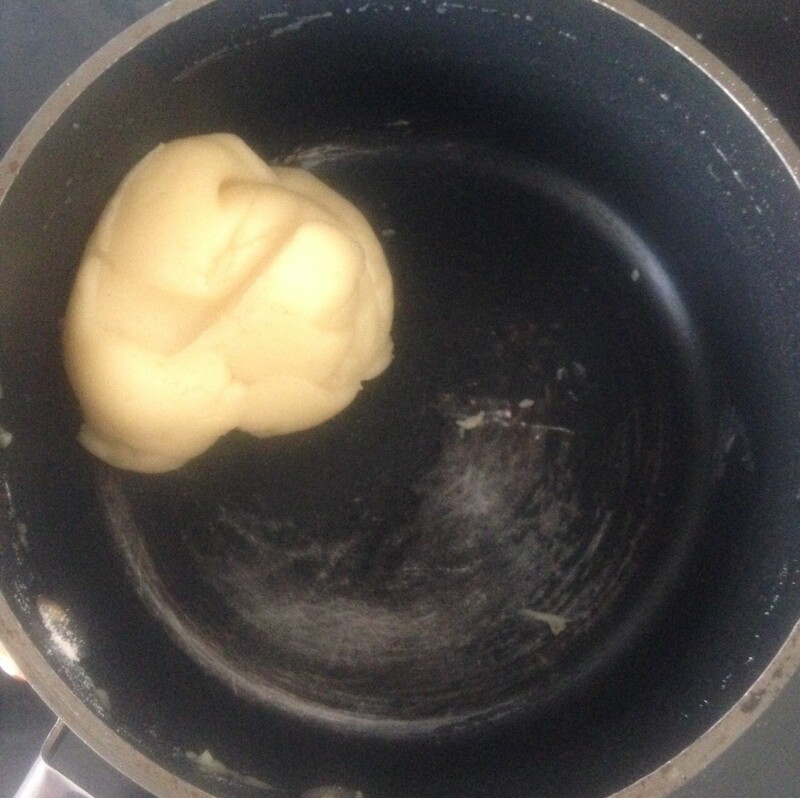 Place the butter and water into a saucepan and stir on a medium heat until bubbles start to form. Combine the flour, sugar and salt into a bowl and stir to combine. Add the flour mix to the water mix and stir constantly with a wooden spoon until the mix comes away from the sides of the pan in a ball. Remove the saucepan off the heat and leave for 5 minutes, allowing for the pastry mix to cool. Beat the eggs in a bowl with electric beaters. Following add the pastry mix beating until the egg is fully combine and incorporated. 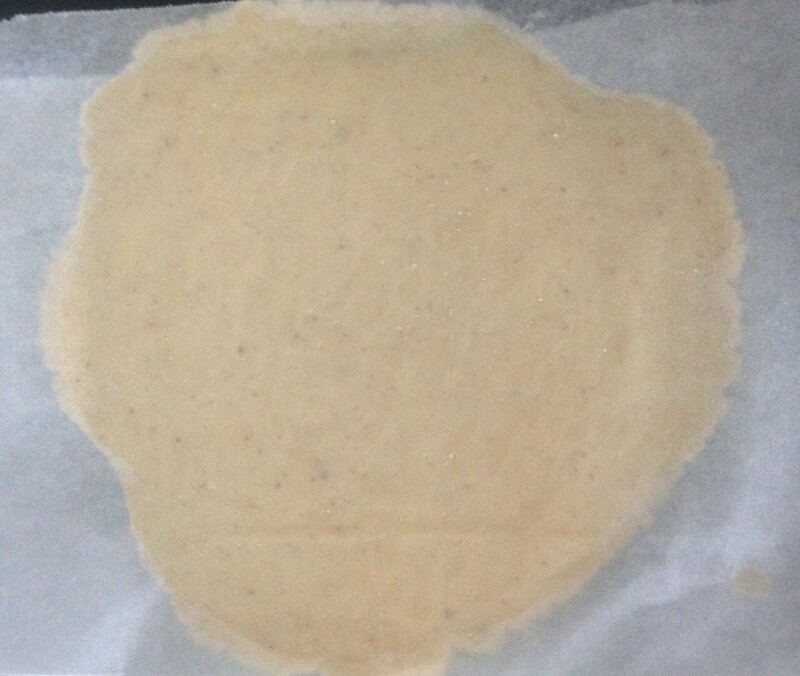 Fit a pastry bag with a 3cm tub nozzle and pipe 12cm pastry strips 3cm apart onto the baking paper. Cut the pastry ends with a wet knife. Bake pastry in the oven for 10 minutes. Turn the oven down to 190c degrees and bake for a further 20 minutes, or until the pastry is puffy and golden brown. 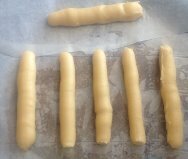 Turn off the oven and cut the éclairs in half horizontally. Following remove some of the pastry soft center from the éclairs. 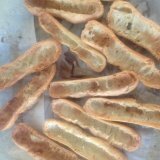 Place the eclairs back in the oven for a further 10 minutes to dry out. 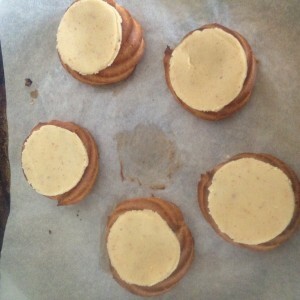 Following leave the éclair shells aside to cool completely. To make the filling beat the cream until soft peaks form. Place the pistachios into a food processor, blitz to a finely diced consistency. Add 25g of the Matcha powder, the icing sugar and 70g of the pistachios into the whipped cream, beat until combine and firm peaks form. Spoon the cream filling into the middle of half of the éclairs where you previously removed some of the centre. Top the cream filling with the remaining eclairs. To make the ganache icing place the butter and chocolate in a saucepan on a low heat and stir until melted, combine and glossy. Add 20g of the remaining pistachios to the ganache with the remaining 20g of Matcha powder, stir until well combined. Spoon the ganache icing over the top of the éclairs. 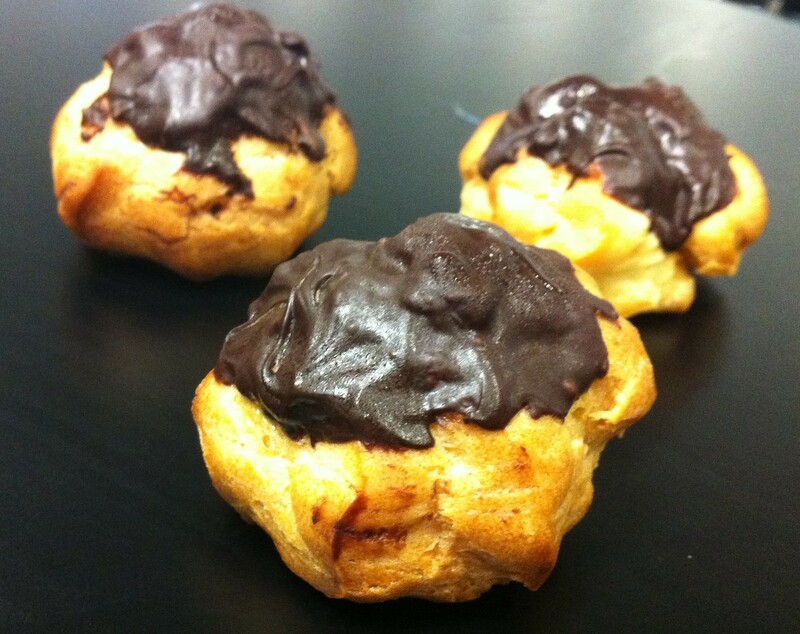 Place eclairs in the fridge to set the ganache icing for a minimum of 30 minutes. 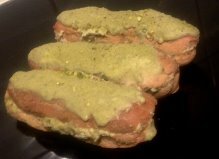 Sprinkle the remaining 10g of pistachios on the éclairs and enjoy. Matcha powder is green tea powder, the same powder used to make green tea ice-cream. 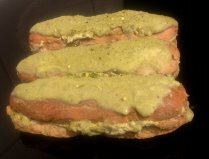 Tags: eclair, Green tea, Green Tea and Pistachio Eclairs, Pistachio	. Posted on January 11, 2016 Posted in France	. 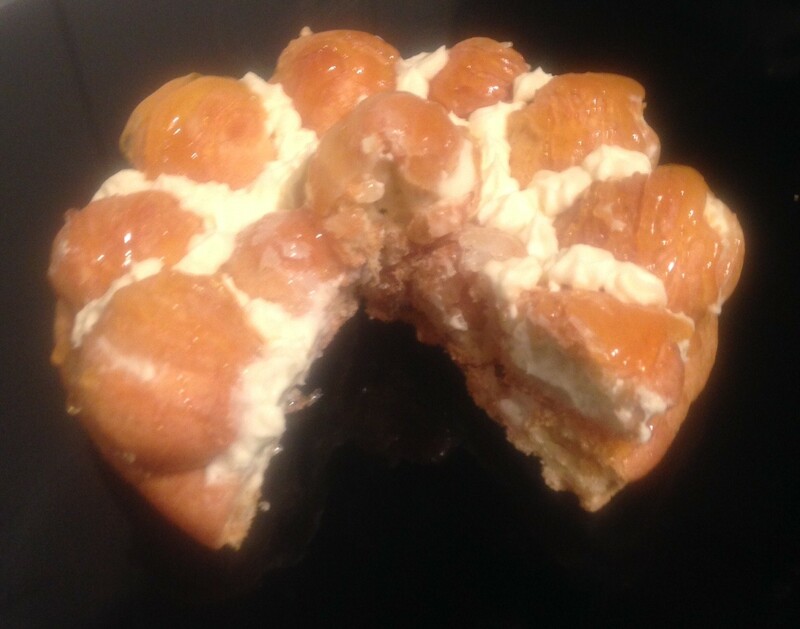 Names after the French Patron saint of bakers and pastry chefs, the Gateau St Honore is another French beautiful pastry based dessert. Think crockenbush with a cookie dough base that is fixated together with beautiful toffee. The cream puff filling adds the soft and fluffy texture, the choux pastry brings a moreish smoothness and the toffee provides a sweet crunch to the treat. A great mix of texture and simple (but addictive) flavour. I have modified this a little to make it easier and a little more appealing (I have piped the filling into the puffs and made a vanilla cream filling instead of crème chiboust). 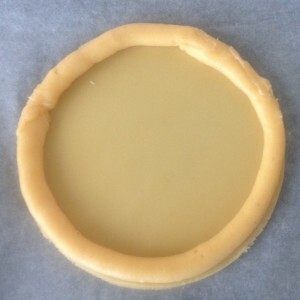 I’m not one to change traditional recipes but the crème chiboust is way too temperamental and to be honest will be difficult to master – unless you are a professional chef. 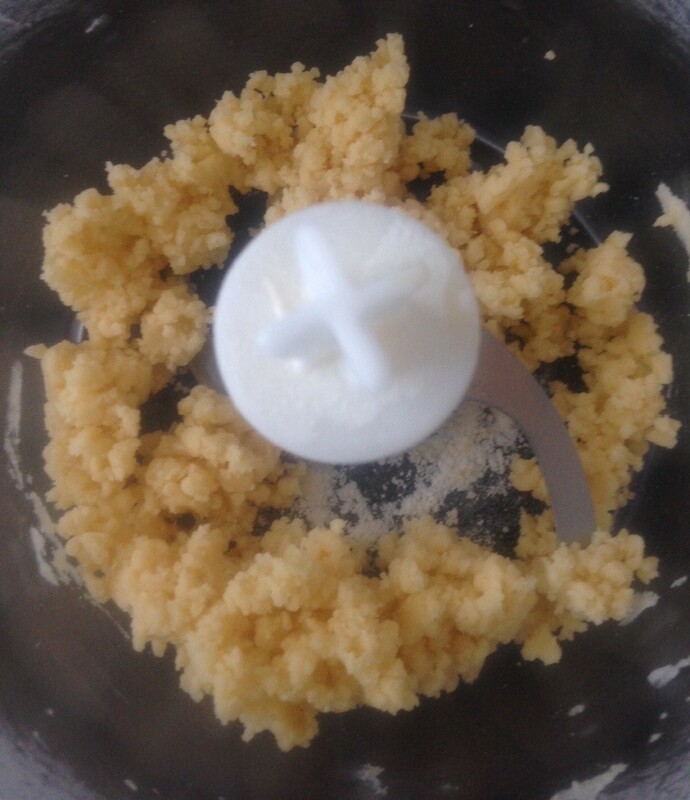 Place flour, sugar and butter in a food processor and blitz until mix resembles fine bread crumbs. Add egg yolk and water and blitz until dough forms a ball. 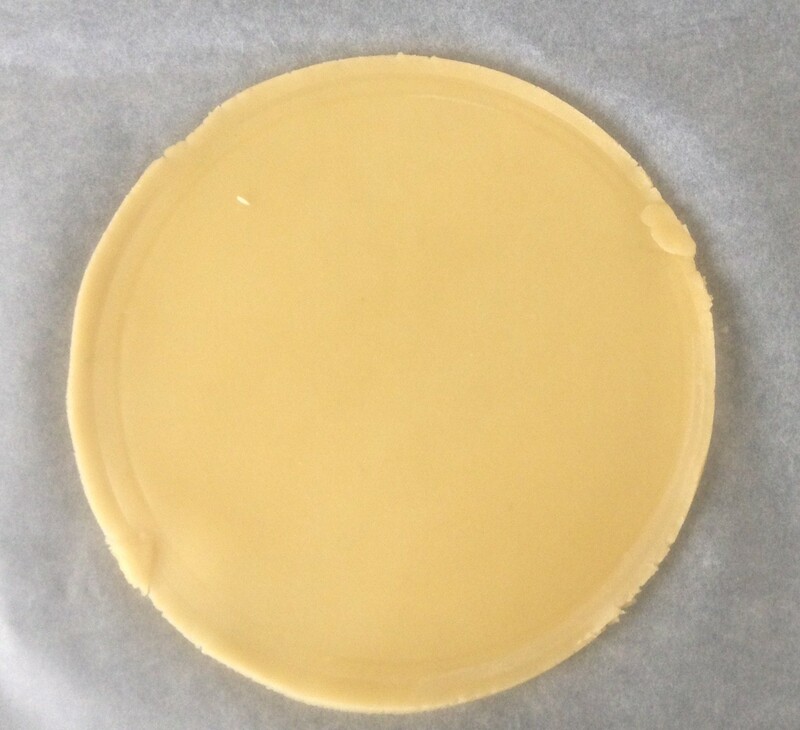 Roll dough in between 2 sheets of baking paper with a rolling bin until you have a 25cm round circle. Place dough in the fridge. On baking paper draw 15 x 4cm circles, 2cm apart. 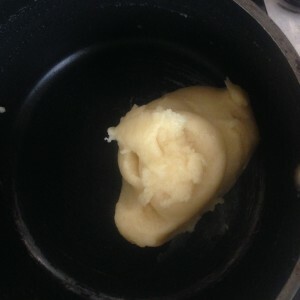 Place the butter and water in a saucepan on medium heat and stir until well combine. Add the flour to the water mix and whisk with a hand whisk until a ball is formed. Take off the heat and whisk in eggs, one at a time. 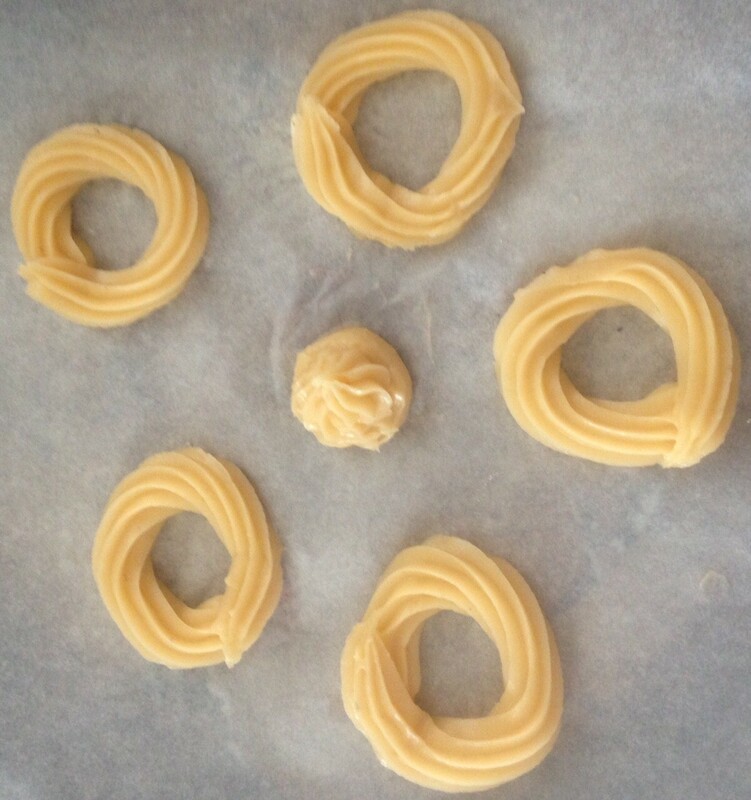 Spoon mix into a piping bag and pipe the pastry into the circles. With the remaining pastry pipe a border around the biscuit base. Turn the heat down to 180c degrees and bake for a further 15 minutes. Using a knife pierce the balls and leave in the oven for a further 5 minutes to dry out. 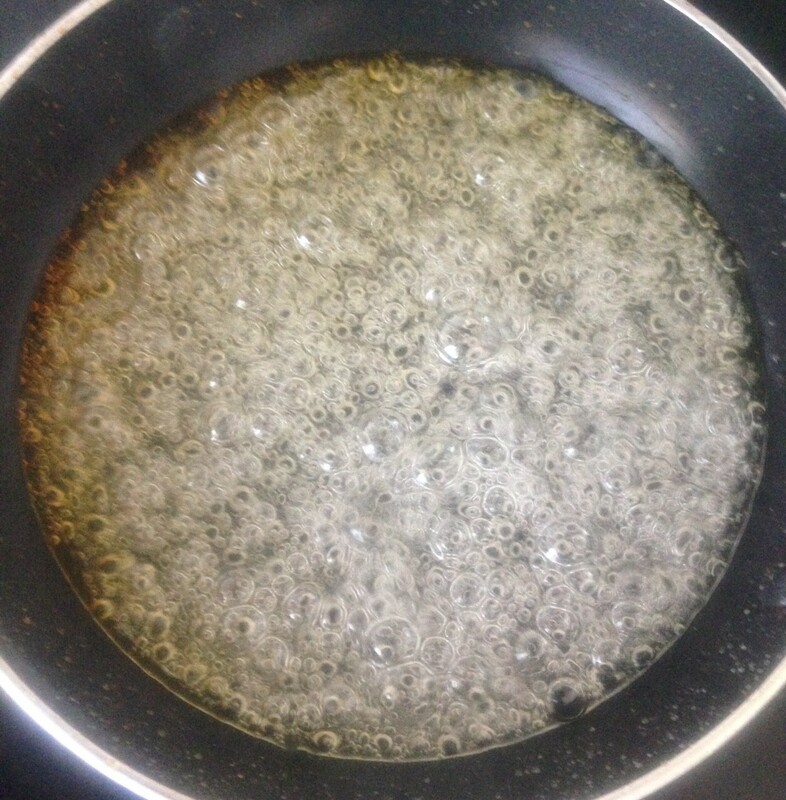 To make the toffee place the sugar and water in a saucepan on a high heat on the stove until the mix becomes lightly golden (this will take around 15 minutes). Using tongs dip all the puffs bar 3 into the toffee and place around the border of the base. With the remaining 3, roll in the toffee and place in the center of the pastry. Spoon the remaining toffee around the puff border, leave to cool. Tags: choux pastry, Easy Gateau St Honore, france, Gateau St Honore	. Posted on October 19, 2015 Posted in France	. You will notice every now and then I dabble in traditional global sweet treats, where Italy, France and America tend to feature more often than not. 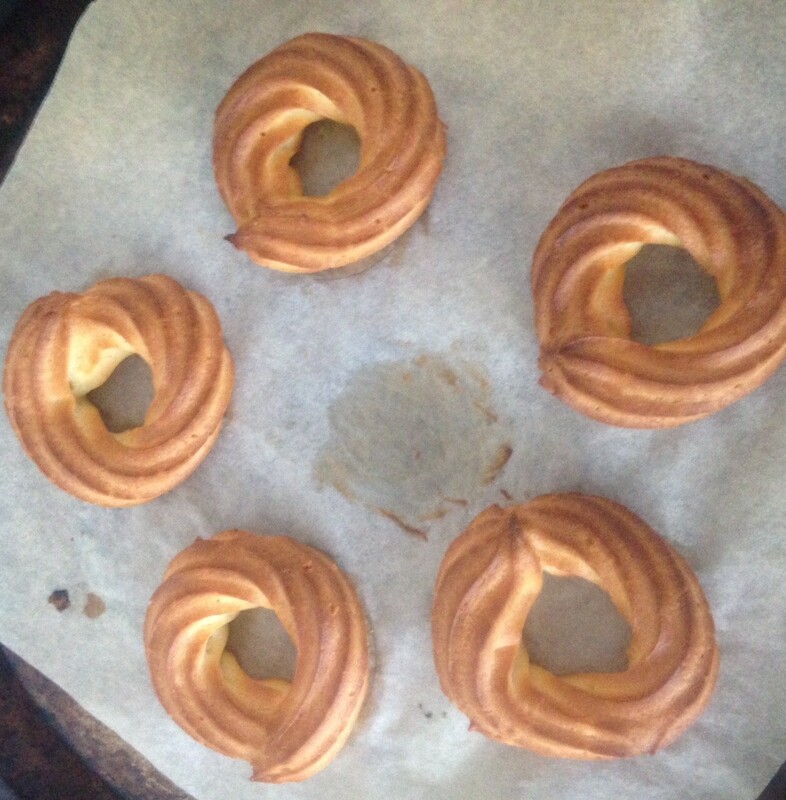 The latest traditional treat I have explored is the Almond Paris Brest. 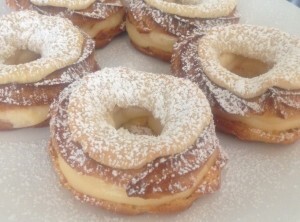 This beautifully elegant pastry treat is a French ring-shaped pastry that is filled with cream patisserie and sprinkled with almonds (or topped with an almond paste) and icing sugar. The delicacy was created in 1891 by a pastry cook whose patisserie was positioned along the route of the bicycle race from Paris to Brest (hence the name). 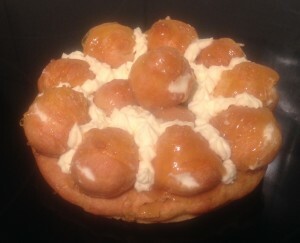 This treat is a mix between a Profiterole and a Éclair, with an almond twist. Elegant, tasty, rich and creamy this treat is satisfaction! Pre heat the oven to 200c degrees and line a large baking tray with baking paper. Draw 14 x 5cm circles on the paper allowing for 2 cm apart. Melt butter and water in a saucepan on medium heat on the stove. Bring to the boil. 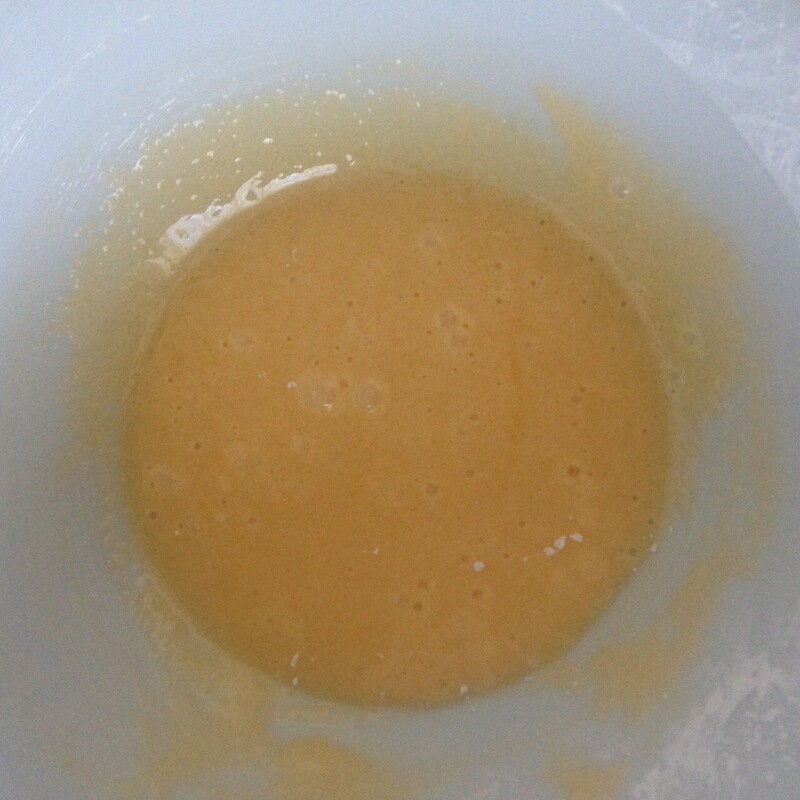 Remove off heat and add the flour and sugar, stirring until a ball is formed. Return to a low heat and cook for 1 minute. 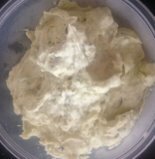 Place the dough into a bowl and add the eggs one at a time, using a hand whisk, beating until the mix is smooth and glossy. Place the pastry into a piping bag fitted with a 1.5cm star nozzle. Pipe a 5cm ring around the drawn circles as a guide. Bake in the oven for 10 minutes, reduce the temperature to 180c degrees and bake for a further 15 minutes until puffed and slightly golden. Cut the puffs in half horizontally and place in the oven turned off for 2 minutes to dry out. 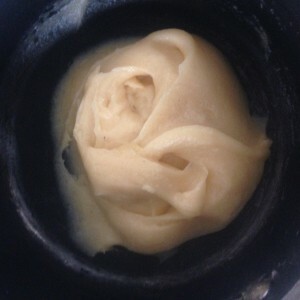 In a bowl mix all the almond paste ingredients and once combine kneed for a minute until smooth and pliable. 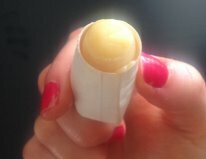 Place the paste in between 2 sheets of paper and using a rolling pin flatten to 3mm thick. 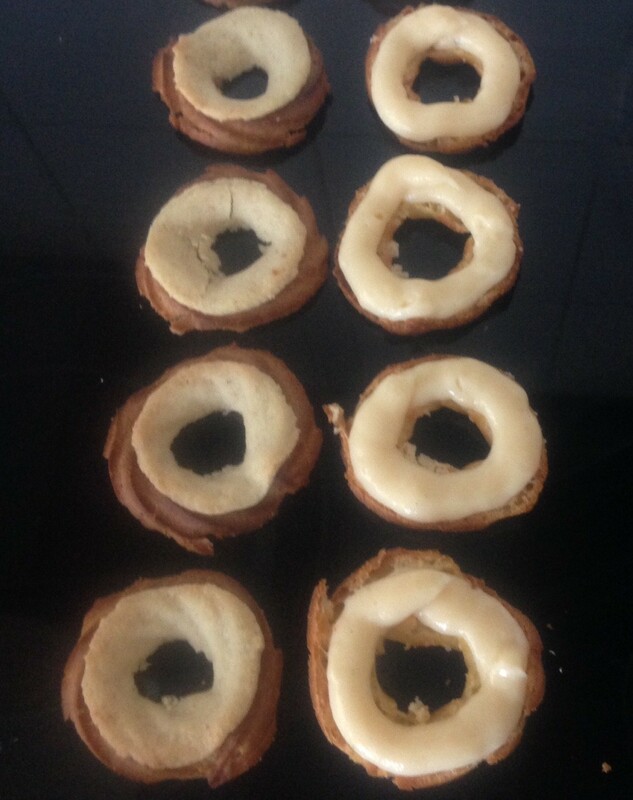 Cut 5cm rounds out of the paste (I used a 5cm cookie cutter) and place the circles on top of the pastry rings. Place the rings on the top half of all the pastries and place back in the oven for 8 minutes or until golden, leave aside to cool. 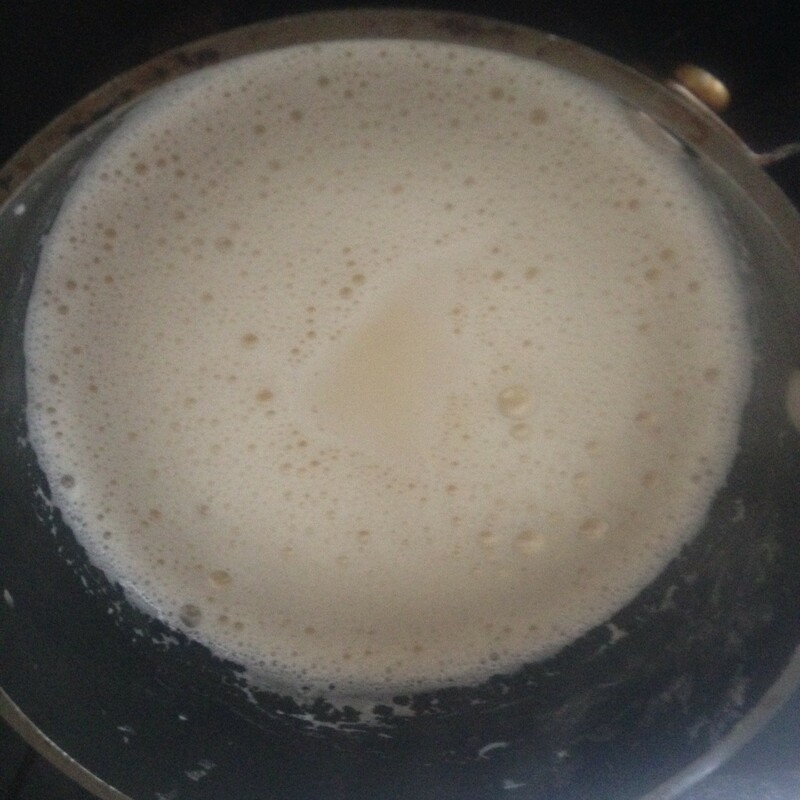 To make the crème patisserie, place the milk into a saucepan on high heat and heat until boiling. In another bowl add remaining ingredients and whisk with a hand whisk until the egg mix is well combine. Still whisking, pour the boiling milk into the egg mix until well combine. Place the mix back on the heat in the saucepan on low heat until boiling and thickened. Set aside to cool. Once the crème patisseries has cooled place in a piping bag and pipe the mix on all the remaining pastries halves (that do not have the paste). Once the mix is used up place the pastry top with the almond mix almont side up on the crème. Tags: Almond, Almond Paris Brest, brest, choux pastry, Crème Patisserie, paris	. Posted on January 10, 2014 Posted in France, Traditional	. I promise you Choux pastry is not hard at all! 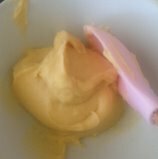 My custard filling recipe is much lower in fat and can be done in the microwave in seconds! 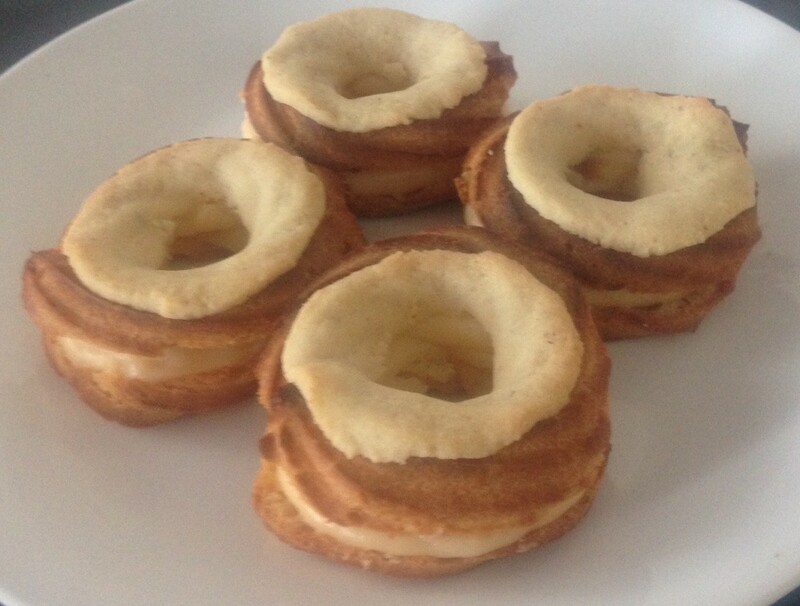 This is definitely an impressive traditional French sweet treat that I have made a little healthier. Traditionally these are filled with whipped cream, ice-cream or pastry cream. These are the little gems that create the famous (thanks Masterchef) Croquembouche. 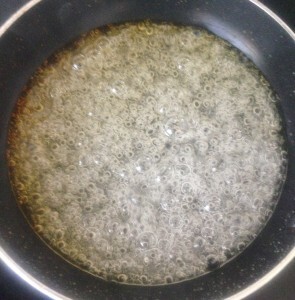 Bring the water and butter to the boil in a saucepan on the stove to a medium heat. Once at a boil add the flour, sugar and salt stirring with a wooden spoon for 5 minutes or until the mix comes away from the side of the pan. Take off the heat, wait 5 minutes and beat the eggs in one at a time. The mix will now resemble dough. 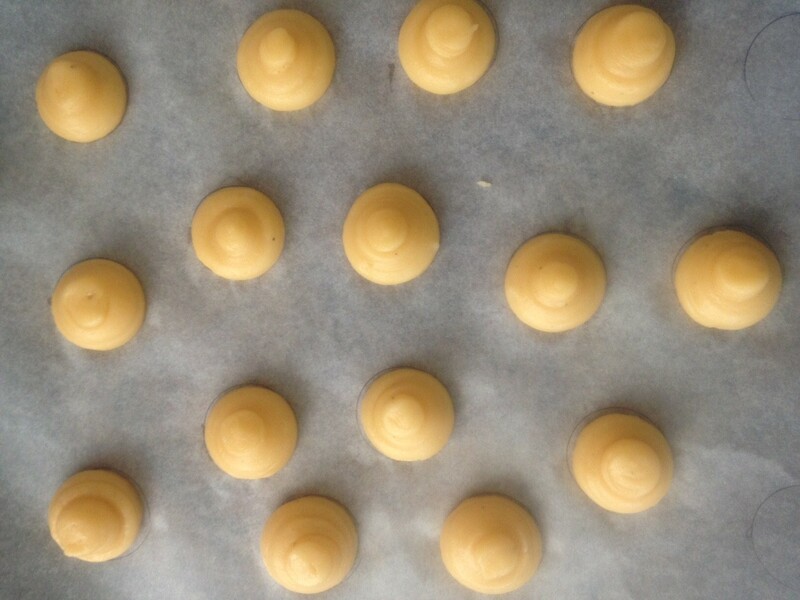 Using a piping bag with a large tip pipe 16 puffs in the size of golf balls leaving 5 cm apart on the 2 trays. Place the 2 trays in the oven and bake for 10 minutes. Decrease the oven temperature down to 190c and bake for a further 20 minutes until the pastry is golden and all puffed up. Turn off the oven. With a knife cut a slit I the top of each puff and leave them in the oven to dry out for 10 minutes. Following place on a cooling rack to cool. To prepare the custard place all ingredients in a microwave safe bowl. Whisk well. 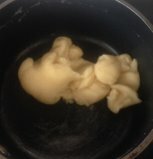 Microwave for 2 minutes on high, then whisk. Cook for a further 30 seconds and whisk. Repeat until the custard is super thick and glossy. Leave to cool. The custard should be thick enough to easily hold its shape. With another piping bag and a medium star tip fill with the cooled custard. Pipe the custard into each puff. 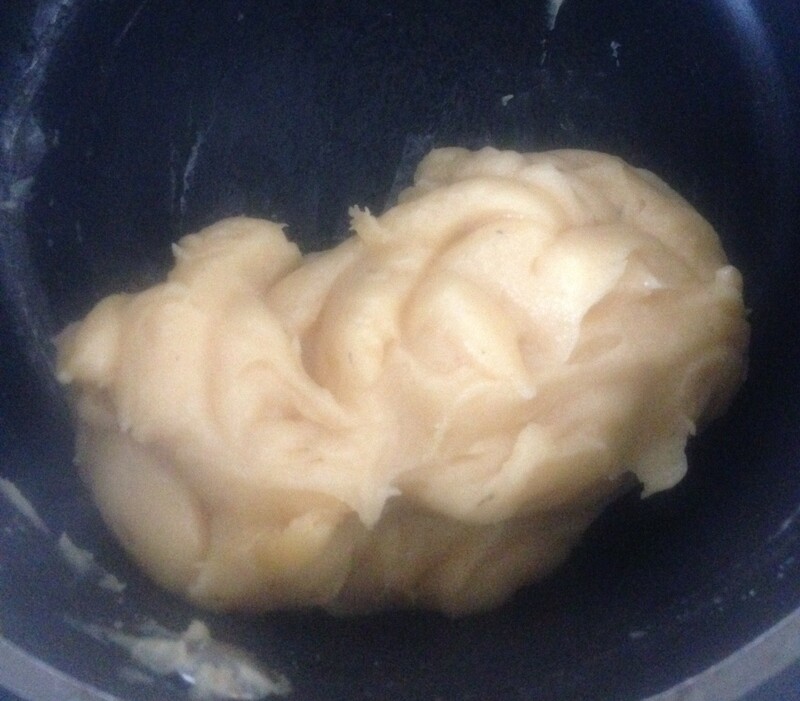 Melt the butter in a microwave safe bowl until bubbling. Add in the chocolate, microwave for 30 seconds. Stir with a metal spoon until thick and glossy. Dip the puff into the chocolate topping and set aside to harden up prior to serving. This is quite impressive but does take a while to work through each of the processes. 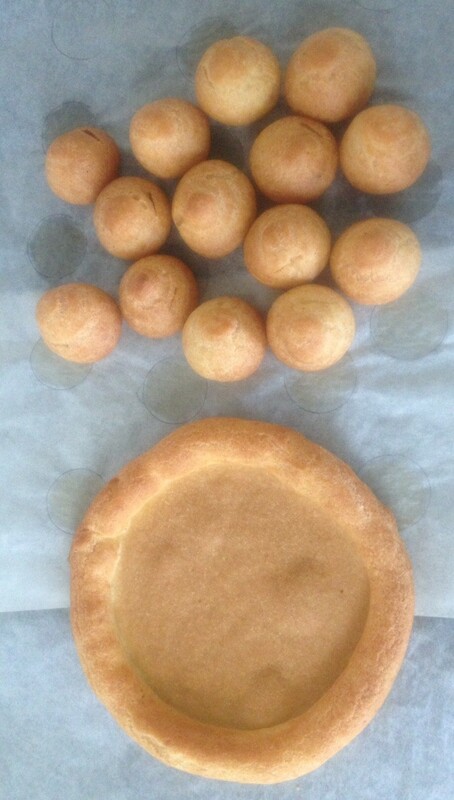 Tags: choux pastry, custard, Profiteroles, puffs	.